Only when the battery is properly charged then the 10th LED (far right) will be lighted. As battery¡¯s state of charge decreases, successive LED lights up, only one at a time. When 2nd (from left) LED flashes, indicating "energy reserve". When both 1st and 2nd LED flash, indicating "empty", new battery is needed to replace old one. Battery indicator memorized the battery state is full when leaving factory. When use with a new battery, it should be powered on for at least 2 minutes to indicate the real battery state. Range indication: Green: 41~100%, Yellow: 21~40%, Red: 20% less. Forklift trucks, Golf Carts, RV's, Boats, Scooters and electric vehicle. etc. Dimensions: Cut-off: 1.5"x1", distance between holes: 1.75", depth: 1.5"
Never let your electric equipment run out of power again. 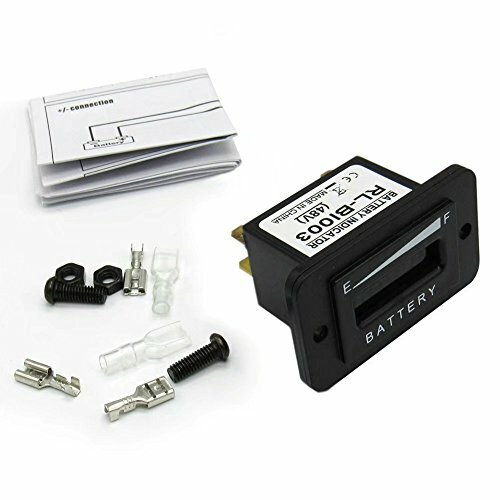 This battery indicator is specifically designed for battery powered equipment to monitor the charge status of the batteries charge.